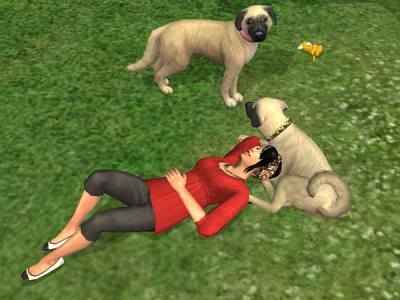 Above, a Sim 2 creation with two of her Anatolian Shepherd Dogs. No, The Sims 3 isn't out yet, but it's getting more interesting all the time so I just had to post! I still haven't found much time to do much of anything with my Sims 2 game in the past year or so, although I install the expansion packs as soon as I get a chance - just so I know the newest disks work. It's such a fine game if I can ever get back to it. Unfortunately, its not really a quick little game, like Tetris or Solitaire, because it is about families and little simulated people and their lives. The simulated scene above shows a young lady who has just bought a house. She brought two Anatolian Shepherd Dogs created from the family creator in the game. The three are not really even familiar with each other yet, although the lady looks comfy to be with her dogs. They need more relationship points before they are close friends and the dogs need to learn basic obedience. My girl hasn't bought any furniture for the house yet, and it's a small one at that, since she didn't have a lot of money (simoleons) to get started. I'm going to have this Sim lady help me do a doggie tutorial eventually. She will probably have a big garden, grow all of her food, a pond where she can fish, and lots of space for her pets. Since her property will have lots of trees, for fruit and landscaping, she's likely to have some wolves as visitors. I like to think she'll be close to nature and I'd like her to meet and marry a rich celebrity Sim -- but since she's a family oriented girl, she might be happy with any compatible sim guy. Since neither she nor I know the neighborhood where she has just moved, she'll have to socialize in her town and maybe do some traveling. Hopefully, she'll fall for a great guy amd eventually have some great kids, some of whom may go to college. I can't remember what she wanted for a career (these are spontaneous and part of their "Life Time Wants", or goals for the game play). I'll have to check it out again some time. I really love The Sims 2! So, I just saw an announcement with a link to a brief and humorous Sims 3 trailer showing a simulated brawl between two Sims 3 simulated VP candidates.